The cremation mausoleum was completed in May of 2005, built to offer protection and security for the cremated remains of loved ones. The structure houses 115 niches, available for individuals or families. Offering a financially beneficial option to family members, the structure also provides protection from environmental elements and vandalism. 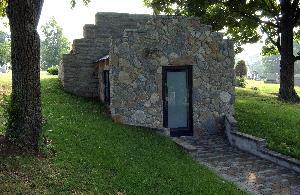 The exterior of the cremation mausoleum was designed by a local mason to blend as part of the natural landscape of the cemetery, but also, to provide a modern structure for an old burial tradition. 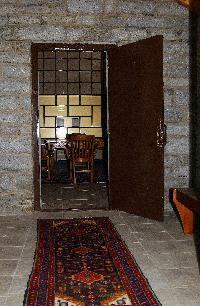 Each niche is visible from the interior of the mausoleum and is covered by a marble or glass front. Memorials, including vases, emblems, frames and name plates, can be mounted on the face of each niche, allowing loved ones to personalize the niches. 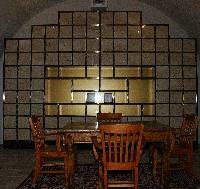 A reflection area is located in the center of the mausoleum, offering a place of solitude and reverence. Only close relatives have access to the structure during cemetery hours, providing privacy and security. The mausoleum is monitored by a security system 24 hours - 7 days per week. Prices range from $550 to $3900 depending on size and location. We offer a 12 month payment plan with a 20% down payment and $50.00 contract fee. The remaining balance after the down payment and contract fee is divided into 12 equal monthly payments with no interest if paid within those 12 months. Please call today and schedule a personal tour of the cremation mausoleum with Zach Wills, Cemetery Manager.